This article provides you the revision notes on Class 12 Chemistry: Chapter- Biomolecules, to give you a quick glance of the chapter. This article is a continuation of the revision notes on Class 12 Chemistry, Chapter- Biomolecules, Part-I & Part II. In Part-I & II you got acquainted to the Carbohydrates, Proteins, Amino acids and Peptides along with their various types. This Class 12 Chemistry: Chapter- Biomolecules, Part-III, explains you about the Enzymes, Nucleic Acids and Vitamins, their various types and structures. These quick notes are prepared strictly according to the latest CBSE syllabus for Class 12th Chemistry. • Enzymes are proteinaceous substances which are used as biological catalysts. • Almost all the enzymes are globular proteins. • Being proteins, they have colloidal nature and get inactivated during reactions and have to be constantly replaced by synthesis in the body. • Enzymes are needed only in small quantities for the progress of a reaction. • Enzymes are very selective and specific for a particular reaction. • Enzymes lower the energy barrier that reactants must pass over to form the products. • An enzyme molecule may contain a nonprotein part which is known as prosthetic group. o Cofactor: The prosthetic group which is covalently attached with the enzyme molecule is known as cofactor. o Coenzyme: The prosthetic group which get attached to the enzyme at the time of a reaction is known as coenzyme. Enzymes are usually named by adding the suffix ‘ase’ to the root name of the substrate, e.g., urease, maltase, invertase, etc. • There is a lock and key arrangement between the an enzyme and a substrate. • Substrates bind at active site, temporarily forming an enzyme-substrate (E-S) complex. • The E-S complex undergoes internal rearrangements that form the product. • The enzyme gets regenerated for the next molecule of the substrate. Nucleic acids are chain like polymers of thousands of nucleotide units, hence they are also called polynucleotides. 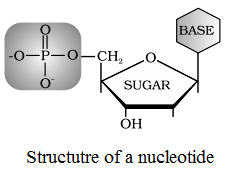 A unit formed by the attachment of a base to 1′ position of sugar is known as nucleoside. A nucleotide consists of three subunits: a nitrogen containing heterocyclic aromatic compound which is called base, a pentose sugar and a molecule of phosphoric acid. 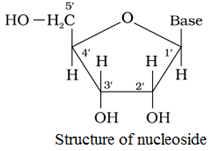 Thus a nucleic acid chain is represented as shown below. • DNA is mainly localised in the nucleus, within the chromosome. While small amount is present in cytoplasm. RNA is also present in the nucleus as well as cytoplasm. • DNA is mainly used in protein synthesis involving RNA and also a major source of genetic information. • DNA contains doxyribosee while RNA contains ribose. • DNA has a double helix structure in which the two strands are antiparellel and are held together by hydrogen bonds. • In DNA molecule, adenine (A) pairs up with thymine (T) via two hydrogen bonds and guanine (G) pairs up with cytosine (C) via three hydrogen bonds. Therefore CG base pair has more stability than AT base pair. It is usually a single strand of ribonucleotides and take up right handed helical conformation. • Sugar part: DNA contains deoxyribose while RNA contain riboses. • Base part: In DNA, four bases have been found. They are adenine (A), guanine (G), cytosine (C) and thymine (T). The first three of these bases are found in RNA but thymine (T) is replaced by uracil (U) in place of Thymine. • DNA is the store house of the hereditary information of the organism. • DNA is involed in protein synthesis. • Vitamins are a group of organic compounds which are essential for normal growth and nutrition and are required in very small amounts for maintaining optimum growth and a good health. • Their absence causes specific deficiency diseases. • Most of the vitamins cannot be synthesised in our body but plants can synthesise almost all of them. • Vitamin D is an exception because it can be made in the skin from exposure to sunlight. • Fat soluble vitamins: Vitamins A, D, E and K are oil soluble. • Water soluble vitamins: The group includes Vitamins B and C. These are stored in much lesser amounts in the cells. Note: Vitamin H (Biotin) is an exception, since it is neither soluble in water nor in fat. Fish liver oil, Milk, butter, egg yolk, green and yellow vegetables. Night blindness, Xerophthalmia (hardening of cornea of eye). Yeast, milk, green vegetables, cereals, fruits, egg yolk. Egg yolk, liver, milk, green leafy vegetables. Cracked lips, sore tongue, digestive disorders and burning sensation of the skin. Milk, egg yolk, cereals, yeast, legumes. Citrus fruits, amla and green leafy vegetables. Milk, ghee, vegetable oils like wheat germ oil, sunflower oil, cotton seed oil. Green leafy vegetables, fish, meat, cereals.